Fireflies is a 4k intro that won the 4k intro competition at Assembly 2012. Can you spot the fireflies? DayDream is a 4k intro rated 10th at Assembly 2011. Includes HDR rendering with bloom and depth of field post processing. Lots of Love is a quickly hacked 4k intro for Assembly 2010. Theoretically interesting meta star effect. Ranked 13th out of 16. We're making a semi-classical modern 3D role playing game. The project continues although the blog is not actively updated. The video here shows something completely unrelated with an old prototype of the 3d engine. Academic Nonsense in pouet.net Academic Nonsense is a 4k intro shown at Assembly 2008, ranked 7th out of eleven qualified participants. Pretty much better than the initial goal, getting the intro to be shown in the big screen. 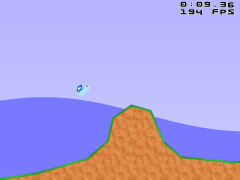 Bloboats is a boat racing game in the spirit of Elasto Mania or X-Moto, but with a handful of style from SMB-like platform jumpers. On your little trip you, for example, have to get past the evil Tentacle Monsters of an Unknown Master, horrible UFO-Invaders and other kinds of awful dangers. 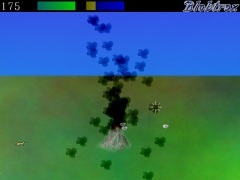 Ranked 4th out of fourteen contestants in Assembly 2006 Gamedev. Bored of Tetris? 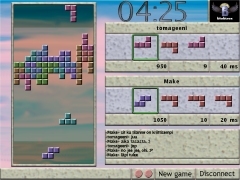 This is what you need, a two-sided multiplayer Tetris-like game (over network) with many blocks falling same time, for two players! In this joke game you are a young boy named Remo'Te, and you have always wanted to protect your Volcano(tm) against the invasion of "7h3 3v1l 4n7z". 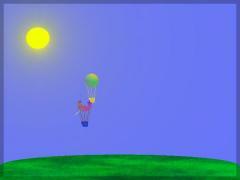 Homepage of Balloon Chase Have you always wanted to blow your opponent's hot air balloon outside the screen? Or perhaps to pop his/her balloon and let him/her drop out the screen? Fantastic! You've been waiting this for a long time! Copyright © 2003-2012 Blobtrox - All rights reserved.